Best comic of the year. I noticed you used some Hunter Green Expo. Feeling the competition? The masses won’t be fooled!!! P.S. I think the office is are overfeeding the plant. Shouldn’t the plant actually be turning false proofs into sugar? 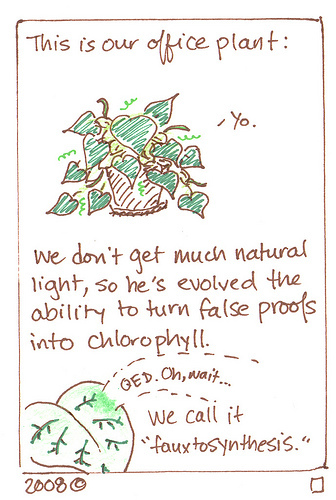 The plant already has chlorophyll. @coconut: I’m not a biology grad student for a reason.